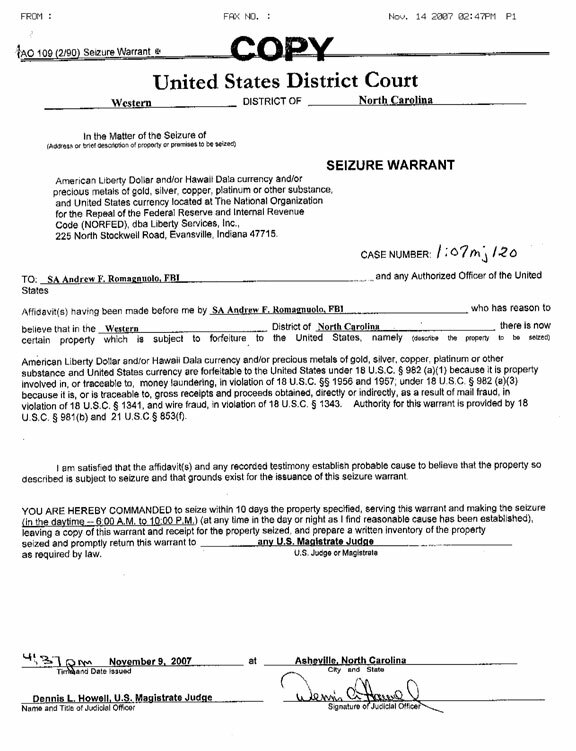 Issued against Bernard von NotHaus, this seizure warrant included both Liberty Dollars and Hawaii Dalas. The Hawaii Dala, an alternative currency launched here in August, was one of the targets of a raid by federal agents on the Indiana headquarters of the group that promotes Liberty Dollars, a court warrant indicates. But Bernard von NotHaus, the architect of both currencies and former mintmaster at the Royal Hawaiian Mint, says the two are completely different. He says holders of Hawaii Dalas have nothing to worry about. He also insists there is nothing illegal about the Liberty Dollar, but is battling the government in court over the issue. The FBI warrant for the Indiana raid on Thursday listed the Hawaii Dala among the items forfeitable to the U.S. under laws which govern money laundering, mail fraud and wire fraud. Pat Breeden, chief executive of Royal Hawaiian Heritage Jewelry, one of only a handful of distributors Hawaii Dalas here, says the coins are more of a collector's item than a true currency. He said yesterday he has had no contact from federal agents. Hawaii Dalas were minted as silver coins in denominations of $20, $10 and $5, along with a $1 Hawaii Dala silver certificate. von NotHaus could not say how many Hawaii Dalas were currently in circulation, but estimated the total amount to be in the thousands. 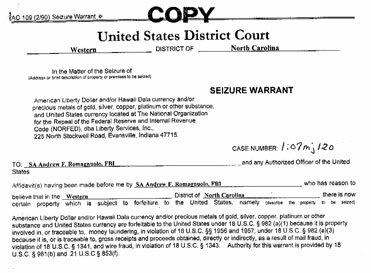 Federal agents who raided the mainland headquarters of the group that makes Liberty Dollars, seizing gold, silver and copper "Ron Paul" dollars, were also targeting the Hawaii Dala that was launched here in August, court documents indicate. FBI agents on Thursday raided the fulfillment center for Liberty Dollars at 225 N. Stockwell Rd. in Evansville, Ind., taking files and computers as well, and freezing the company's accounts. But Bernard von NotHaus, the creator of both currencies, says Hawaii clients have nothing to be worried about because the Liberty Dollar is completely different from the Hawaii Dala. "They went to the fulfillment office, so there's no reason for any concern whatsoever," von NotHaus said. "They're not tied together. They're two totally different currencies, period." He could not say what dollar amount of Hawaii Dalas was seized from the Indiana office, nor how much is circulating in Hawaii, but estimated it to be in the thousands. In comparison, more than $20 million in Liberty Dollars are in circulation. "There's still nothing illegal about the Hawaii Dala or the Liberty Dollar," insisted von NotHaus. "There is the phrase, innocent until proven guilty." But the FBI seems to disagree, given that it included the Hawaii Dala in its seizure warrant, and listed it as one of the forfeitable items to the U.S. under a law related to money laundering, wire fraud and mail fraud. FBI spokesman Brandon Simpson did not return calls for comment by press time. von NotHaus, a mintmaster at the Royal Hawaiian Mint for 25 years, is the "monetary architect" behind the controversial Liberty Dollar as well as the Hawaii Dala, which he advocates as inflation proof. He is also the founder of the National Organization for the Repeal of the Feral Reserve Act & Internal Revenue Code -- or NORFED -- a group that maintains U.S. adults have the right to trade silver and gold. The U.S. Mint last year warned that the use of the Liberty Dollar was not legal tender. von NotHaus responded by filing a lawsuit, seeking a declaratory judgment against the U.S. Mint. The Dalas were introduced at the Pagoda Hotel in August, with Sen. Sam Slom (R, Diamond Head-Hawaii Kai) present. Issued by Bernard von NotHaus, the Hawaii Dala was among the currency seized during an FBI raid. 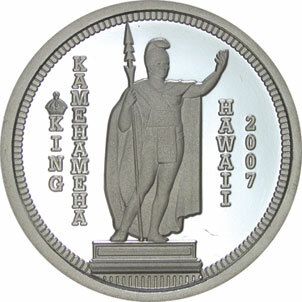 The silver coins come in denominations of $20 (1-ounce), $10 (half-ounce) and $5 (quarter-ounce) and are stamped with King Kamehameha, King Kalakaua and Queen Liliuoakalani. There is also a $1 Hawaii Dala silver certificate. In press materials for the August event, von NotHaus said these Hawaii Dalas could voluntarily be used like cash to buy plate lunches, at the grocery store, and from participating merchants. Only a handful of distributors carry the Hawaii Dala here, including Royal Hawaiian Heritage Jewelry. "I made an order that day," said Pat Breeden, CEO of Royal Hawaiian Heritage. "Guess I'm not getting my order." Breeden said he was not concerned about the raid, nor does he expect federal agents to be taking action in Hawaii. "It's not like we have tons and tons," he said. "It's a nice commemorative coin. I don't think anyone's using the Hawaii Dala like the Liberty Dollar. But coins generate more value with a story behind them, and at this point, these coins are no longer being made." Slom said von NotHaus had a reputation for doing fine-quality commemorative pieces after his years working at the Royal Hawaiian Mint, and that's why he helped with the launch, but that he had no involvement afterwards. "We thought it was an interesting proposal," said Slom. "But it was something that people would have to decide for themselves if it was worthwhile for them." von NotHaus has since moved out of Hawaii, but declined to say where his home was -- only that he traveled a lot advocating his currency, which he calls "value-based." He said he would like to return for a visit to Hawaii, if he's not arrested. He also vows to do battle with the U.S. government over the right to use the Liberty Dollars. On his Web site, www.libertydollar.org, he asks people to help fund his lawsuit against the government, and now, is also urging Liberty Dollar owners to join a Class Action suit in an effort to get their money back. "Well, I don't have anything else to do with my life," he said. "I'm retired, and this keeps the juices flowing."